“If one ranks the American empire as the world’s most powerful, rivaled only by imperial Rome in its heyday, then for a brief moment, by the close of his time in office,” George H. W. Bush was “the most powerful man in human history.” So says Jeffrey A. Engel, founding director of the Center for Presidential History at Southern Methodist University, in the Introduction to his insightful volume When the World Seemed New: George H.W. Bush and the End of the Cold War. He bookends that proposition in his Conclusion with, “George Bush left the White House in 1993, leaving behind what might well have been the most powerful state in human history.” In between, Engel proves his case. Engel convincingly posits that, notwithstanding domestic failures and his ill-fated “no new taxes” promise, Bush’s legacy is not determined by the stigma of being a one-term president. Rather, it is more properly measured by the way he guided the nation through worldwide turmoil that included the breakup of the Soviet Union and war in Iraq to position the United States as that true “city upon a hill” once advocated by Puritan preacher John Winthrop. How Bush got us there, in what Engel calls “the most internationally complex [presidency] since that of Franklin D. Roosevelt,” may surprise you. George H. W. Bush may well have been the most qualified person to ever enter the White House, having served in the U.S. House of Representatives, as an ambassador to the United Nations and China, director of the CIA, and two terms as vice-president. Assuming the presidency on the heels of Ronald Reagan, though, was a tough act to follow. Reagan had laid the groundwork for the collapse of the Soviet Union with his “Mr. Gorbachev, tear down this wall” speech in June of 1987. When Bush was elected president a little more than a year later, the country was ready for him to rush headlong into the breach, push over the wall, and dance on the rubble. But Bush trod cautiously, driven by a belief that democracy’s victory over totalitarianism was inevitable, and that the worst thing he could do was to rush it, thereby threatening that inevitability. Engel calls it Bush’s style of “‘Hippocratic diplomacy.’ That is, he first strove to do no harm.” Instead, he cultivated a friendship, or the closest thing to it, with Soviet leader Mikhail Gorbachev, who was walking tightropes of his own, both economically and politically, with his joint policies of glasnost (which Engel defines as “a new ‘openness’ for a Soviet society long governed by secrecy and fear”) and perestroika (“a general ‘reconstruction’ of Soviet communism complete with increased political and economic freedom”). Engel demonstrates how Bush overcame his initial distrust of Gorbachev and, when the Berlin Wall finally fell, guided by the example of China’s failures in its handling of events at Tiananmen Square, he took up for the United States the mantle of world leadership in shaping not only a reunified Germany, but also in influencing democracy in the former Soviet satellites of Eastern Europe. 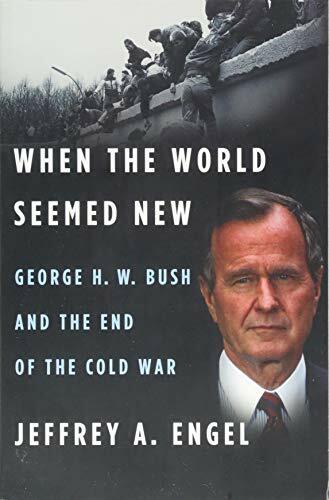 When the World Seemed New reveals how George H. W. Bush mixed toughness with diplomacy, and patience with action, tempering it all with decency, while nurturing alliances such as those with NATO nations, to secure for the United States its position as, not “a” world leader, but “the” world leader in the wake of the Soviet Union’s collapse and the end of the Cold War. If we remember nothing else about history, let us remember that.